Background and objectives Nutritional status remains a powerful predictor of outcome in the dialysis population. High body mass index (BMI) seems protective, but which body compartment (fat or lean mass) confers this protection remains unclear. Design, setting, participants, & measurements This was a longitudinal study (n = 60; n = 46 completed) examining changes in body composition in incident peritoneal dialysis (PD) and hemodialysis (HD) patients over 12 months. We measured total body protein (TBP) by in vivo neutron activation, expressed as nitrogen index (NI), and lean body mass (LBM) and total body fat (TBF) by dual-energy x-ray absorptiometry. Visceral and subcutaneous fat areas (SFAs) were determined from computed tomography. Comparisons were made between different BMI groups and dialysis modalities. Results No significant change was found in TBP, NI, or TBF. The obese group (BMI >30) had an increase in all mean LBM parameters with a significant increase in NI compared with normal-weight and the overweight group. This increase in NI remained significant after multivariate analysis β coefficient (0.08). PD patients had the greatest increase in TBF, with a significant increase in visceral fat (VFA:SFA ratio β coefficient = 0.23). Conclusions Obese patients showed preservation of TBP compared with normal- and overweight patients, suggesting that energy storage as fat mass is of value in the dialysis population. Protein-energy wasting (PEW) is defined as a state of decreased body stores of protein and energy fuels and is often associated with functional decline (1). It is common in the dialysis population (2) and its etiology is multifactorial, resulting from decreased nutrient intake and increased catabolism because of multiple comorbid conditions, metabolic acidosis, and chronic inflammation (1,3). In addition, the dialysis procedure itself incites an inflammatory response that can lead to protein and lean tissue mass breakdown (4), thereby further exacerbating hypercatabolism. Large observational studies show PEW to be a powerful predictor of morbidity and mortality (5,6). Body mass index (BMI) is commonly used in epidemiologic studies because it is simple to perform, reproducible, and known to predict clinical outcome (7,8). Whereas in the general population high and low BMIs are predictive of poor outcome (9), in the dialysis population only low BMI is consistently predictive of poor outcome, with studies showing high BMI, even in the obese range, to be protective (10,11). Many of the traditional nutritional parameters are influenced by variables such as inflammation and fluid balance abnormalities (12,13), both of which are common in the dialysis population. BMI has a further limitation in that it does not discriminate between total body fat (TBF) and lean body mass (LBM). Studies attempting to confirm which body compartment confers the mortality benefit associated with increased BMI in the dialysis population use indirect measures of body composition and have yielded mixed results (10,14,15). To date there are no studies investigating this issue using direct measures of body composition. We hypothesized that a higher BMI is protective because of increased energy storage as TBF, which could lead to relative preservation of LBM. Our aims were to examine (1) changes in body composition over the first year of dialysis using criterion methods capable of discriminating between TBF and LBM, (2) whether greater BMI at baseline was associated with preservation of LBM, (3) the effect of different dialysis modalities on body composition, and (4) whether baseline clinical parameters predict detrimental changes in body composition. This prospective longitudinal study examines changes in body composition using an array of gold standard measures (detailed in Table 1). Subjects were recruited from Southern Health Nephrology. Baseline measurements were taken 2 to 3 months after commencement of dialysis, thereby enabling stabilization without allowing significant changes in body composition to occur. Inclusion criteria were permanent arteriovenous access, age between 18 and 80 years, and ability to give written informed consent. Subjects were excluded if they had had a limb amputation, intercurrent illness or hospitalization within the preceding 3 months, or a planned living related transplant within the next year. Subjects were on conventional satellite hemodialysis (CHD) 4 to 5 hours 3 times per week, peritoneal dialysis (PD), or extended-hours home hemodialysis (HHD) 6 to 8 hours every alternate day. Subjects were divided into three groups according to their baseline BMIs: (1) normal weight (BMI 18.5 to 25), (2) overweight (BMI 25.1 to 30), and (3) obese (BMI >30). The study was carried out in accordance with the Declaration of Helsinki and was approved by the Southern Health Human Research Ethics Committee at Monash Medical Centre in Clayton, Australia. All body composition measurements were performed with subjects at their dry weight either 1 hour after hemodialysis (HD) or drained out with an empty peritoneum. Two experienced nurses performed all anthropometric measurements using standardized methods. Height was measured without shoes to the nearest 0.1 cm using a Harpenden stadiometer, and weight was measured in a hospital gown to the nearest 0.1 kg. BMI was calculated as body weight (kg) divided by height (m) squared. Blood samples were taken after an overnight fast, and, for those on HD, they were taken immediately before dialysis during the mid-week dialysis session. Serum parameters measured included albumin, transthyretin, high-sensitivity C-reactive protein, cholesterol, and IL-6. Serum concentrations were analyzed at Monash Medical Centre using a Synchron LX 20 Pro autoanalyzer (Beckman Coulter, Inc., Fullerton, CA). IL-6 concentrations were measured using enzyme-linked immunosorbent assay module sets (Bender MedSystems, CA). Total body weight can be divided into the primary compartments of TBF, LBM, and skeleton. LBM consists of protein (found in skeletal muscle and visceral organs) and water (intracellular and extracellular). Total body nitrogen (TBN) directly correlates with body protein stores (16) and is the gold standard measure of total body protein (TBP). TBN was measured by in vivo neutron activation (coefficient of variation [CV] <4%) in a purpose-built facility that has been used for several different populations (17,18). TBN was normalized (for gender and height) to the general population and expressed as nitrogen index (NI). TBP was calculated as 6.25 × TBN content. Dual-energy x-ray absorptiometry (GE Lunar Prodigy Fan Bean using software version 9.3; Madison, WI) was used to measure TBF (CV approximately 2%) and LBM (CV approximately 3%). Visceral and subcutaneous abdominal regional adipose tissue volumes were obtained from a single computed tomography image at the level of the fourth and fifth lumbar vertebrae and calculated by a single operator (R.P.) using customized software (SliceOmatic program software, version 4.2, Tomovision, Montreal, QC, Canada). The intraobserver CV was 4% for visceral fat area (VFA) and 3% for subcutaneous fat area (SFA). The VFA-to-SFA ratio was calculated as VFA/SFA (cm2). Total body water (TBW), intracellular water (ICW), and extracellular water (ECW) were measured using multifrequency bioimpedance (intramuscularly; Impedimed SFB7BIS, Brisbane, Australia), and ECW was expressed as a percentage of TBW calculated as ECW/TBW (in L) × 100. Results are expressed as mean ± SD or median and interquartile range depending on data distribution for continuous variables and as frequency and percentages for categorical variables. All skewed data were log transformed to meet standard normalized distribution criteria for analysis. The t test and χ2 test were used for comparison of baseline parameters between those who lost and gained weight and between those who completed the study and those who dropped out for continuous variables and categorical variables, respectively. Associations between inflammatory parameters and BMI and dialysis groups were assessed by ANOVA. Analysis of covariance was used to assess differences over time in body composition parameters between the three BMI and dialysis groups with normal-weight and CHD groups as the reference group. Adjustments were made for baseline differences in the dependent variable and for gender, diabetes, BMI, and dialysis modality. P < 0.05 was considered statistically significant. All analyses were conducted using Intercooled Stata 10.0 (StataCorp, College Station, TX). Baseline demographics, body composition parameters, and repeat measurements at a mean of 13.3 ± 1.6 months in those who completed the study are shown in Table 2. Sixty incident dialysis subjects were included with a mean age of 59 ± 14 years, 62% were men, and 45% had diabetes. Twenty-one (35%) were on PD, 17 (28%) were on CHD, and 22 (37%) were performing extended-hours HHD. The mean weight was 81 ± 21 kg and the mean BMI was 28 ± 6. There was no significant difference at baseline in demographics, comorbidities, or medications that influence body composition between the BMI or dialysis groups (data not shown). There was a significant difference in IL-6 between the dialysis groups (PD = 2.4 ± 0.8 pg/ml versus HHD = 1.9 ± 0.8 pg/ml, P = 0.04), but there was no difference within BMI groups. Fourteen subjects did not complete the study because of death (n = 8), renal transplantation (n = 1), transfer to another renal unit (n = 2), or unwillingness to return for the end-of-study assessments (n = 3). They had similar baseline demographics except for a higher proportion of diabetics (79% versus 35%, P = 0.005) and lower high-sensitivity C-reactive protein concentrations (3.8 mg/L versus 5.4 mg/L, P = 0.09). Within the entire cohort there was no significant change in body composition, including TBP (9.3 to 9.3 kg, P = 0.99), NI (0.94 to 0.94, P = 0.82), LBM (49.3 to 49.6 kg, P = 0.87), and TBF (26.9 to 29.7 kg, P = 0.38). There was an increase in TBW of 2.4 L with a significant reduction in the ECW-to-TBW ratio from 53% at baseline to 42% (P < 0.001). All three groups showed a gain in weight (1 to 3 kg) that was significantly greater in the obese group compared with the normal-weight group (β coefficient = 9.65 kg, 95% confidence interval [CI] 3.58 to 15.71, P = 0.003) (Table 3). In the normal- and overweight groups, most mean LBM parameters decreased. There was no difference in NI in the overweight group compared with the normal-weight group (β coefficient = 0.005, 95% CI −0.05 to 0.06, P = 0.84). The obese group showed an increase in all mean LBM parameters with a significant increase in NI compared with the normal-weight group (β coefficient = 0.07, 95% CI 0.01 to 0.13, P = 0.02) and the overweight group (β coefficient = 0.06, 95% CI 0.01 to 0.12, P = 0.03) (Figure 1). In multivariate analysis adjusting for gender, diabetes, and dialysis modality, the increase in NI in the obese group compared with the normal-weight group remained significant (β coefficient = 0.08, 95% CI 0.01 to 0.14, P = 0.02). This significance persisted when IL-6 was added to the model (β coefficient = 0.09, 95% CI 0.02 to 0.15, P = 0.01). All groups showed an increase in TBF not significantly different between the BMI groups. There was no significant difference in changes in water compartments between the BMI groups. Difference in nitrogen index by body mass index (bmi) groups. Using CHD as the reference group, we found no significant difference regarding measures of LBM (Table 4). TBF increased in all modalities; however, the HHD group gained significantly less TBF compared with CHD (β coefficient = −3.12 kg, 95% CI −5.67 to −0.56, P = 0.018) and PD (β coefficient = −2.50 kg, 95% CI −4.68 to −0.27, P = 0.03) (Figure 2), which persisted on multivariate analysis adjusting for gender, diabetes, and BMI (β coefficient = −2.62 kg, 95% CI −5.23 to −6.69, P = 0.04). However, this was no longer significant after IL-6 was added to the model (β coefficient = −2.27 kg, 95% CI −4.75 to 0.21, P = 0.07). PD was associated with a significantly greater increase in the VFA/SFA compared with CHD (mean difference 0.23, 95% CI 0.05 to 0.42, P = 0.015), which remained statistically significant after multivariate analysis (mean difference 0.24, 95% CI 0.04 to 0.43, P = 0.02) and persisted after adjustment for IL-6 (β coefficient = 0.21, 95% CI 0.01 to 0.42, P = 0.04). All modalities showed an increase in TBW and decrease in ECW/TBW, and although HHD showed the smallest decrease, it was not statistically significant (β coefficient = −0.004, 95% CI −0.05 to 0.47, P = 0.86). Difference in total body fat by dialysis modality. HD, hemodialysis; PD, peritoneal dialysis; HHD, home hemodialysis. Twelve subjects (26%) lost a mean weight of 5.4 ± 5.1 kg compared with a mean gain of 4.6 ± 4.2 kg in the remainder of the study group. Patients who lost weight lost TBP and TBF (0.47 and 0.79 kg, respectively). There was no significant difference in baseline body composition or biochemical parameters between those who lost weight and those who gained weight (Table 5). This study is unique in that it measures longitudinal changes in body composition using gold standard measures for individual body compartments in a group of incident dialysis subjects over 12 months. Obese subjects had a significant increase in NI, as a measure of TBP, compared with normal-weight and overweight subjects. Different dialysis modalities had little effect on changes in NI, but they did influence changes in TBF. 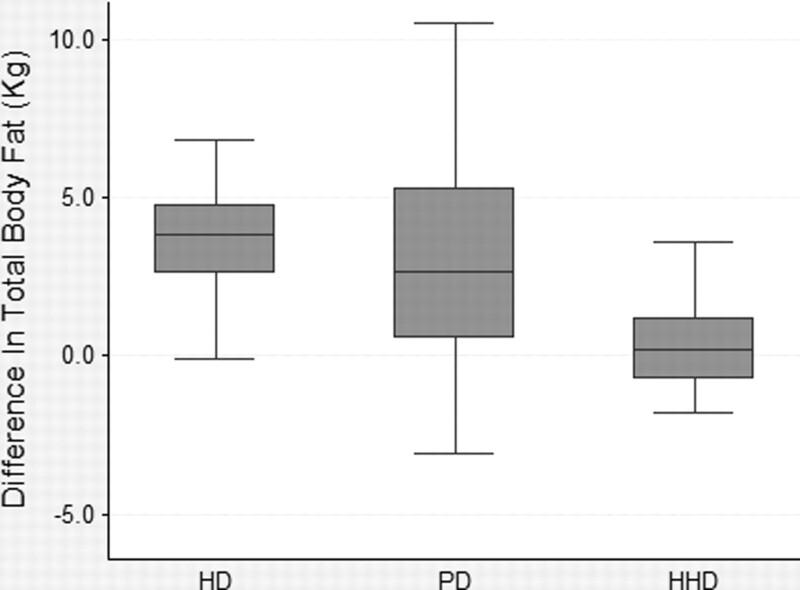 Although TBF increased in all groups, those on extended-hours HHD showed significantly less gain, whereas those on PD showed the greatest gain, with a significant increase in visceral fat. Uremia and the dialysis procedure generate a state of chronic inflammation with increased catabolism and protein degradation (3,4,19), which can lead to loss of TBP. TBN measurement (often expressed as NI), a highly specialized technique available in only a handful of centers worldwide, directly correlates with body protein stores (16) and remains the gold standard measure of TBP. There are only two studies examining the association between TBN and mortality in the dialysis population, with one reporting an NI <0.8 leading to a 48% likelihood of death within 12 months (20) and the other reporting a doubling of the hazard ratio of death at 6 years (21). Extensive studies have shown that high BMI is associated with lower mortality rates in the dialysis population (8,11), and although it seems intuitive to assume this is due to an increase in LBM, as some studies support (14,22), a longitudinal study in 535 maintenance HD patients found that baseline body fat percentage and fat loss were independently predictive of death after adjustments for LBM (15). A study examining the determinants of partitioning between TBF and LBM during starvation found that initial percentage of fat was the strongest predictor of the fraction of energy mobilized as protein during food deprivation (23). This suggests that higher TBF protects muscle mass against catabolism during starvation, thus maintaining LBM. We found that subjects with a higher BMI at the beginning of dialysis had an increase in all measures of LBM, with a significant increase in NI, whereas normal- and overweight subjects showed a decrease in mean LBM. TBF increased in all BMI groups, with no significant difference between the groups, suggesting that in the dialysis population, in which hypercatabolism is common, excessive energy storage may be beneficial because of relative preservation of TBP stores. In our study, dialysis modality had little effect on LBM, which is generally consistent with the reported literature (24–26). However, Pollock et al. reported a significant increase in TBN in PD, but not in HD patients, in a prospective analysis of 71 patients reassessed after a mean of 23 months (20). The anabolic effect was attributed to improved control of acidosis with reduced protein turnover, less protein degradation, and fewer dietary restrictions. Dialysis modality did affect TBF, with PD patients showing the greatest mean gain with a significant increase in the ratio of visceral to subcutaneous fat. Given that PD patients receive a daily caloric load in the form of glucose via the peritoneal dialysate, it would seem plausible that they would have an increase in TBF. Most studies confirm this (27–29); however, one of the rare studies examining a prevalent PD population reported a large variability in TBF changes, with only 53% gaining TBF over a year (30). Studies examining the effect of dialysis modality on fat distribution are limited and conflicting. Although some report increased abdominal or truncal fat in the PD population (27,29), Saxenhofer et al. found no difference in central or peripheral TBF between a group of stable HD and PD patients, although this study was cross-sectional and used unconventional computed tomography levels for assessment of fat distribution, which may have affected the results (31). There is strong evidence confirming the importance of fat distribution on cardiovascular and metabolic risk, with increased visceral fat shown to be more predictive of cardiovascular outcome than overall obesity in the general population (32,33). There are now preliminary data suggesting that visceral fat is similarly important in the dialysis population (34). That the PD patients in our study and in others have shown a predominant increase in visceral fat compared with subcutaneous fat may go some way toward explaining why patients on PD have not shown consistent survival benefits with increased BMI (35,36). Indeed, a large study from Australia reported increased mortality and technique failure associated with obesity in a group of incident PD patients (37). Extended-hours HHD was associated with significantly less gain in TBF compared with the more traditional regimens. Although it could be argued this may not be beneficial given the lack of increase in LBM and the apparent protective effect of generalized TBF, our result is likely confounded by the fact that HHD patients tend to be healthier and less sedentary than those on conventional dialysis. More studies are needed to confirm whether extended-hours HHD affects TBF accumulation or fat distribution and, by extension, cardiovascular outcomes. We found an increase in TBW that was predominantly ICW. If we assume the relationship between TBP and ICW at steady state applies to dialysis patients at ideal weight, we would expect to see an increase in total body potassium, which we did not. That said, the increase in TBW was not statistically significant and may lie within the error of the test, given that multifrequency bioelectrical impedance analysis is less precise than TBN. In our study, 26% of the study patients lost weight consisting of TBP and TBF. Inflammation plays a key role in the development of PEW (1,12) and has been shown to inversely correlate with muscle mass in cross-sectional studies (38). We were unable to show that inflammatory parameters or any other clinical or body composition parameters at baseline were predictive of weight loss (Table 5), which is consistent with previous reports (26). Our lack of time-averaged inflammatory concentrations and our small study size are likely to have contributed to the lack of association seen between inflammation and subsequent weight loss. The strengths of our study include its longitudinal design, a richness of body composition measurements, and the use of gold standard methods including a measure of TBP that is not affected by hydration status. Limitations include small sample size, possible selection bias, and we only collected body composition measures at baseline and the end of the study. That said, there was no significant difference in clinical or body composition parameters between those who completed the study and those who did not, and we adjusted for baseline levels when analyzing changes in body composition parameters to minimize the likelihood of regression to the mean. In conclusion, using gold standard methods we found that dialysis modalities affected changes in TBF, with extended-hours HHD associated with the smallest increase and PD associated with the greatest, with a significant increase in the ratio of visceral to subcutaneous fat. Obese patients (BMI >30) showed greater preservation of TBP compared with normal- and overweight patients that persisted on multivariate analysis. This would suggest that energy storage as TBF is of value in the dialysis population. Further studies are required to examine whether changes in energy components have an effect on patient survival and cardiovascular outcomes. The authors thank the scientists at the Body Composition Laboratory, including Janet Hope, Karen Paresienne, Dr. Sam Lo, Anne Marie Stroud, Wilma Williams, and Jennifer Moran. R.P. helped design, conduct, and analyze the study and wrote the manuscript. B.S., K.P., and P.K. helped design, analyze, and revise the manuscript.